Partition hangers easily attach whiteboards and bulletin boards to cubicle walls. Fits over cube walls between 1 1/2" and 2 1/2" thick. Compatible with Oval Office™ fabric bulletin boards and most Quartet® aluminum-frame boards. Silver, nickel-plated finish matches board frames and the décor of most contemporary offices. Two hangers per set. 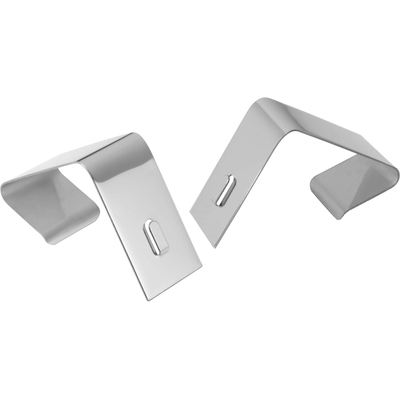 Strong cubicle partition hangers help make your cubicle more efficient. Easily and securely attach whiteboards and bulletin boards to cube walls measuring between 1 1/2" and 2 1/2" thick. Compatible with Quartet® Oval Office™ fabric bulletin boards and most Quartet® aluminum-frame whiteboards. Silver, nickel-plated finish matches board frames and the décor of most contemporary offices. Two hangers per set.